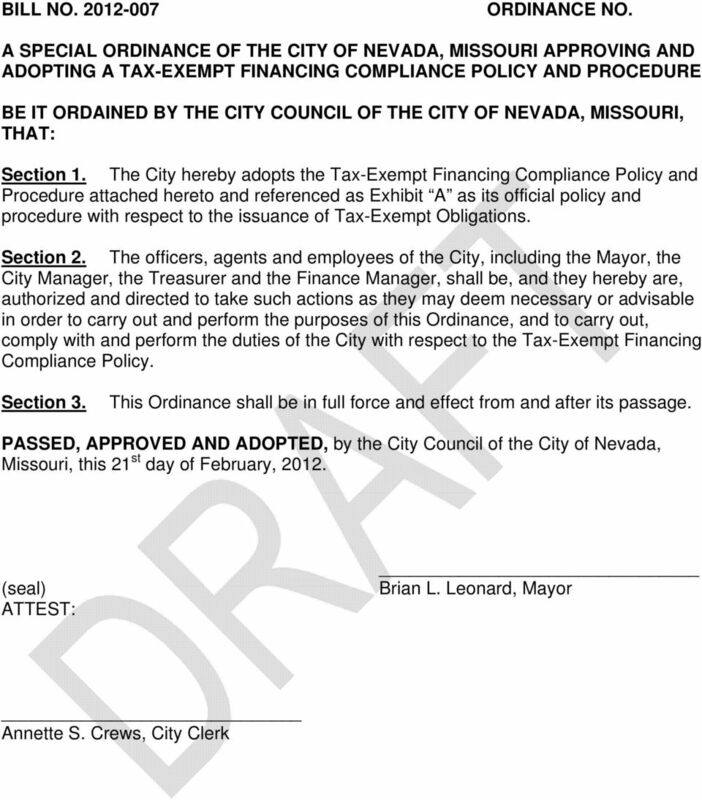 AGENDA ITEM February 21, Resolution adopting Tax Exempt Financing Policy & Procedure. Download "AGENDA ITEM February 21, 2012. 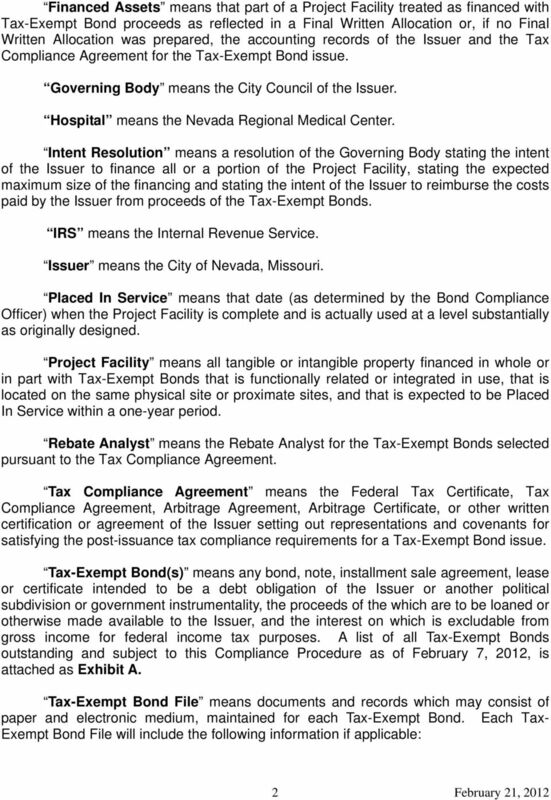 Resolution adopting Tax Exempt Financing Policy & Procedure." 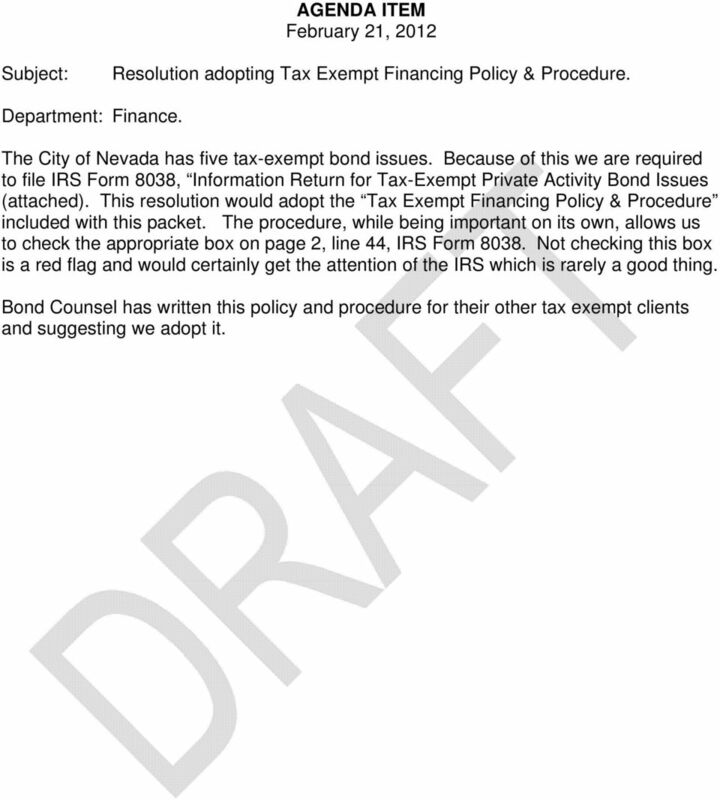 1 AGENDA ITEM February 21, 2012 Subject: Resolution adopting Tax Exempt Financing Policy & Procedure. Department: Finance. 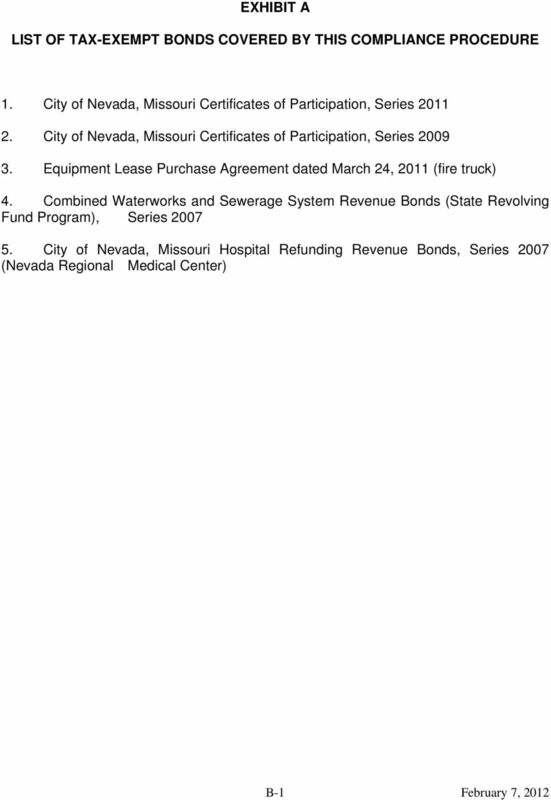 The City of Nevada has five tax-exempt bond issues. 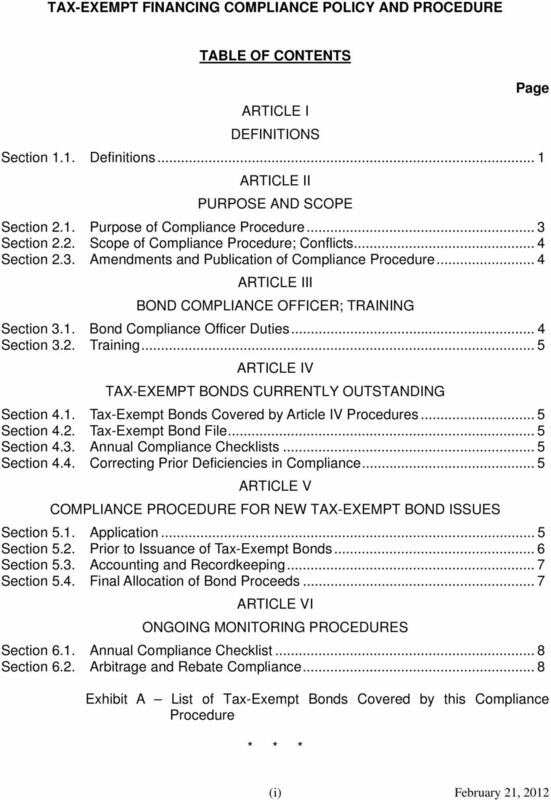 Because of this we are required to file IRS Form 8038, Information Return for Tax-Exempt Private Activity Bond Issues (attached). This resolution would adopt the Tax Exempt Financing Policy & Procedure included with this packet. The procedure, while being important on its own, allows us to check the appropriate box on page 2, line 44, IRS Form Not checking this box is a red flag and would certainly get the attention of the IRS which is rarely a good thing. 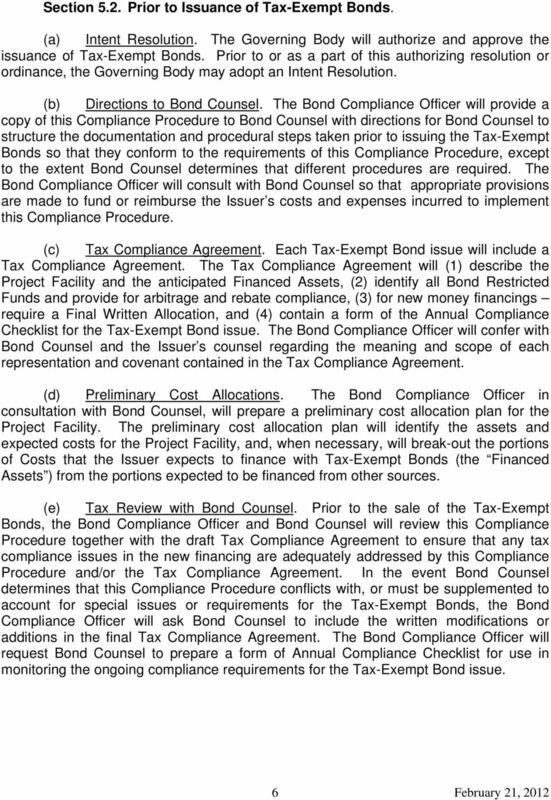 Bond Counsel has written this policy and procedure for their other tax exempt clients and suggesting we adopt it. 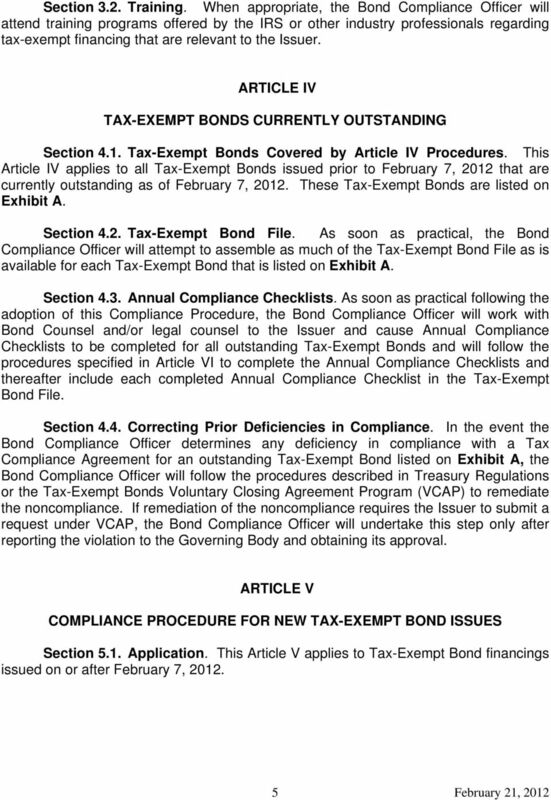 5 TAX-EXEMPT FINANCING COMPLIANCE POLICY AND PROCEDURE ARTICLE I DEFINITIONS Section 1.1. Definitions. 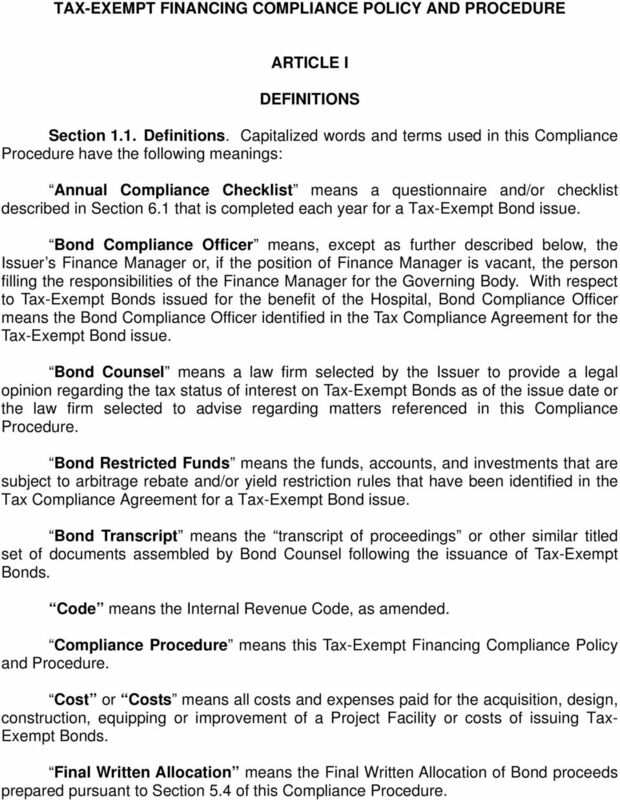 Capitalized words and terms used in this Compliance Procedure have the following meanings: Annual Compliance Checklist means a questionnaire and/or checklist described in Section 6.1 that is completed each year for a Tax-Exempt Bond issue. Bond Compliance Officer means, except as further described below, the Issuer s Finance Manager or, if the position of Finance Manager is vacant, the person filling the responsibilities of the Finance Manager for the Governing Body. 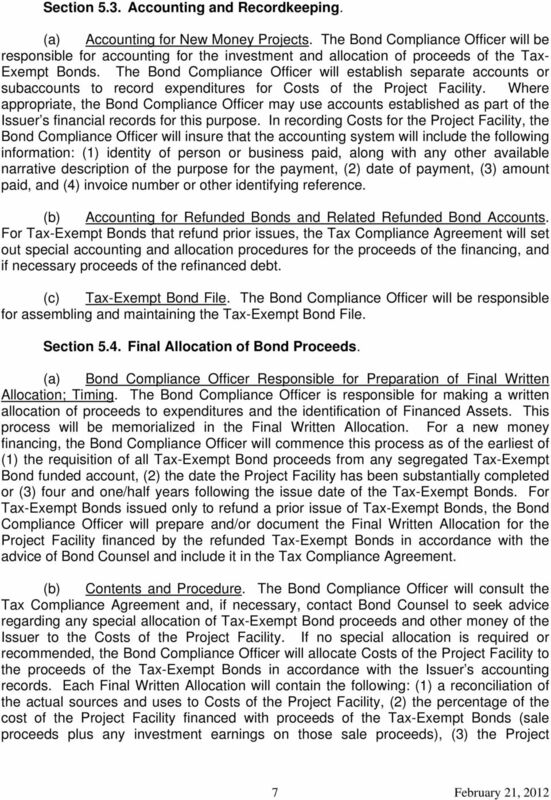 With respect to Tax-Exempt Bonds issued for the benefit of the Hospital, Bond Compliance Officer means the Bond Compliance Officer identified in the Tax Compliance Agreement for the Tax-Exempt Bond issue. 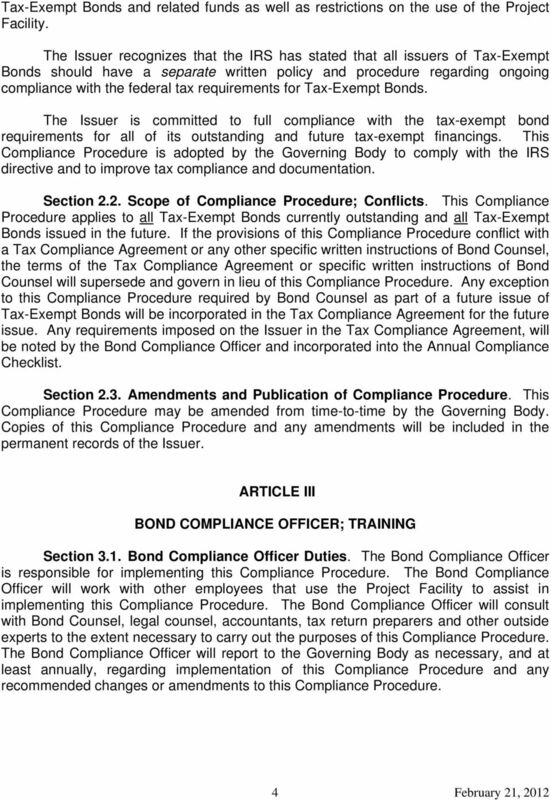 Bond Counsel means a law firm selected by the Issuer to provide a legal opinion regarding the tax status of interest on Tax-Exempt Bonds as of the issue date or the law firm selected to advise regarding matters referenced in this Compliance Procedure. Bond Restricted Funds means the funds, accounts, and investments that are subject to arbitrage rebate and/or yield restriction rules that have been identified in the Tax Compliance Agreement for a Tax-Exempt Bond issue. 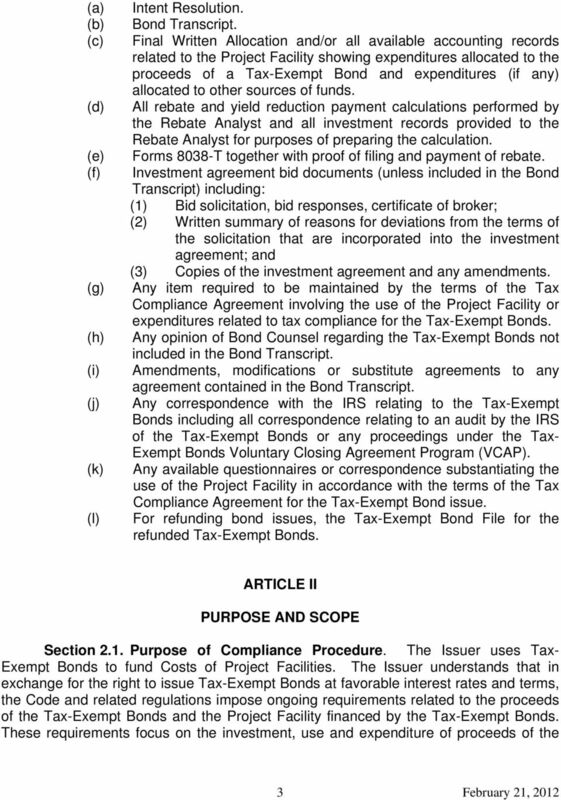 Bond Transcript means the transcript of proceedings or other similar titled set of documents assembled by Bond Counsel following the issuance of Tax-Exempt Bonds. Code means the Internal Revenue Code, as amended. 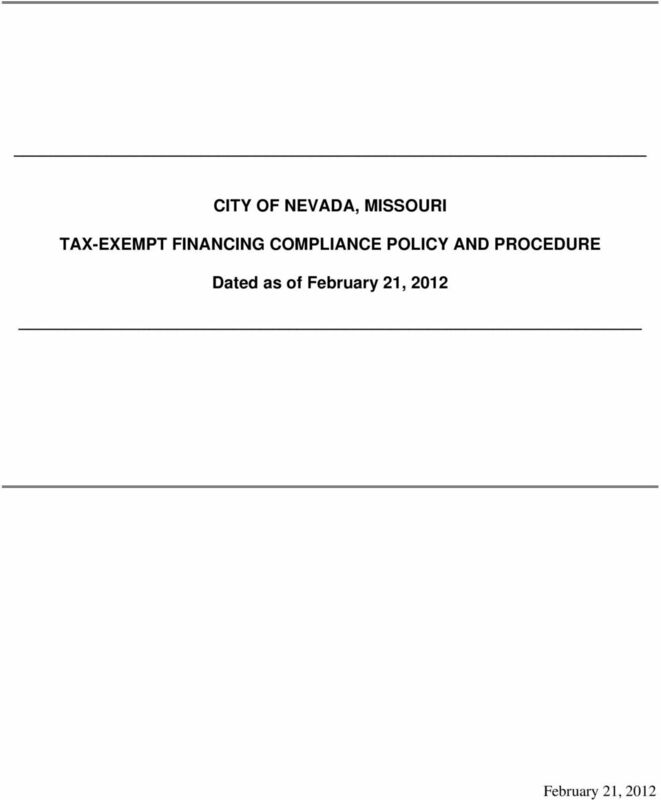 Compliance Procedure means this Tax-Exempt Financing Compliance Policy and Procedure. Cost or Costs means all costs and expenses paid for the acquisition, design, construction, equipping or improvement of a Project Facility or costs of issuing Tax- Exempt Bonds. 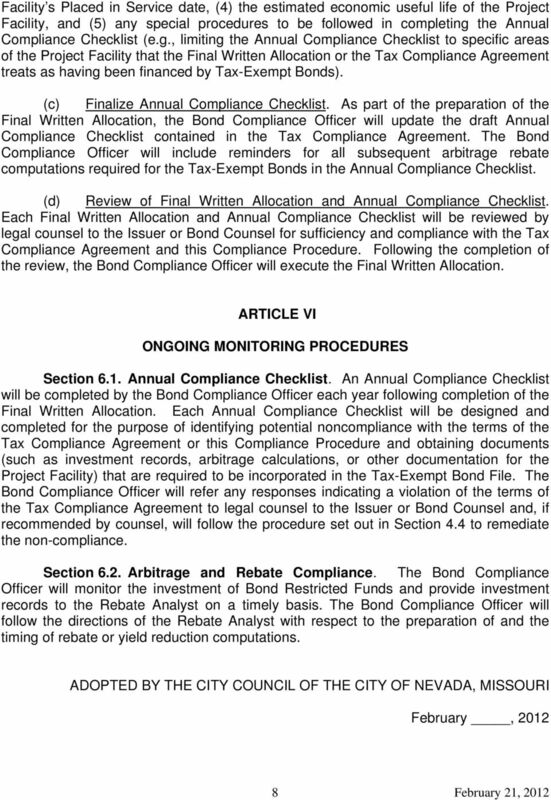 Final Written Allocation means the Final Written Allocation of Bond proceeds prepared pursuant to Section 5.4 of this Compliance Procedure. SAMPLE FINANCING AGREEMENT FOR GENERAL OBLIGATION COMMERCIAL PAPER FINANCING AGREEMENT. between TEXAS PUBLIC FINANCE AUTHORITY. and.